On the occasion of its 20th anniversary, the Bonn International Center for Conversion (BICC) hosted a two-day international academic conference on “Facing Organized Violence: Research Agendas and Conversion Potentials” from 27 to 28 October 2014 in Bonn. Panelists and speakers were high-ranking academics from peace and conflict research. Around 100 experts and practitioners of various disciplines from Germany and abroad participated. After a welcome by Conrad Schetter the conference was opened by Svenja Schulze, Minister for Innovation, Science and Research of the State of North Rhine-Westphalia. Initial addresses by Thomas Göbel, Head of Divison, German Federal Foreign Office, and Jakob Rhyner, Director, United Nations University, followed. 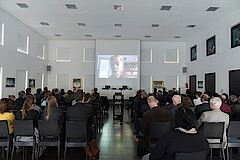 The keynote by Carolyn Nordstrom, University of Notre Dame Indiana, USA, was given via Skype. The conference was sponsored by the Foundation for International Dialogue of the Savings Bank in Bonn and the U.S. Consulate General Düsseldorf.